Sunday February 26 1911 Will went to town in the morning for more paper. I was all forenoon getting dinner. We thought Alma would stop but she did not. I wrote some in the afternoon and read a book. 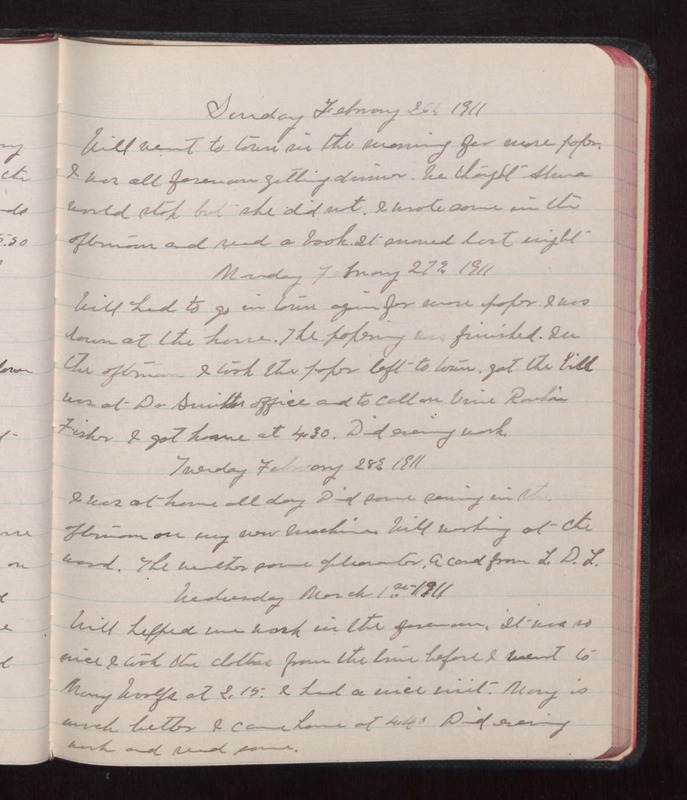 It snowed last night Monday February 27 1911 Will had to go in town again for more paper. I was down at the house. The papering was finished. In the afternoon I took the paper left town. Got the bill was at Dr Smiths office and to call on [Vera?] [Rankin?] Fisher I got home at 4.30. Did evening work. Tuesday February 28 1911 I was at home all day Did some sewing in the afternoon on my new machine. Will working at the wood. The weather some [illegible]. A card from L.D.L. Wednesday March 1st 1911 Will helped me work in the forenoon. It was so nice I took the clothes from the line before I went to Mary Woolfs at 2.15. I had a nice visit. Mary is much better. I came home at 4.40. Did evening work and read some.